Video analytics remains one of the most controversial areas within surveillance today, fueled by new bogus claims from one fringe player after another. However, certainly some video analytics are being used but how much and what types? The second question was left open-ended, so integrators could choose their favorite instead of being confined to a preselected list of options. We also gave space for comment so they could explain their choice, or why they did not deploy analytics. Of 84 total responses, over twenty unique analytics providers were named. The most striking outcome of the survey was confirmation of how infrequent video analytics are being used and the widespread lack of confidence in video analytics. However, a few analytics providers stood out, though by much smaller margins than in our other survey questions. Integrator responses also showed much less consensus than in other survey questions we have asked. Inside, we examine these points in depth. Based on these numbers, 60% of integrators rarely or never implement video analytics. Some trends emerged, which we examine below. One factor which made little difference was geography. US vs. international responses did not materially differ. "The cost vs. the results aren't there yet. Difficult to make analytics work in an uncontrolled environment." "Not a reliable solution. Too much hype." "We have not found an application that works correctly yet." "We don't have time to play games. Too many new installs to accomplish and it's only about 85% accurate of the time." "They do not work on a consistent basis. They are clearly oversold in the market place." "Other than basic trip wire and direction of motion we consider analytics as a totaly unreliable technology at this stage but believe it will get better." Those integrators deploying an average of sixteen cameras or fewer per site were nearly 40% more likely to never deploy analytics (33% vs 46%). This is likely due to the target verticals of systems this size, often small retail and commercial. These customers are much less likely to require analytic capabilities than more complex users. Systems size otherwise made little difference in deployment statistics. Based on those with a preference, VideoIQ gathers 25% of the vote, double the votes of runner-up AgentVI. Bosch gathers 8.5% of the vote in third. Cernium and Sightlogix both received a few mentions, with about 6% each. What is most clear about this survey question is how fragmented the video analytics market is, with numerous small players, yet few companies showing any sort of dominance. Among integrators having a favorite, the top three responses only gathered 45% of votes, much lower than in VMS software and IP cameras where the top three gathered over 60% of the votes. Respondents answered this question with a total of 21 unique manufacturers. This is more than the number of unique IP camera manufacturers mentioned in our favorite IP cameras poll question. Yet, 44% of respondents had no preferred video analytics provider, compared to only one integrator claiming no IP camera manufacturer preference. "VideoIQ. The technology requires a minimal amount of maintanence due to its ability to adapt to its environment." "The only manufacturer we use is VideoIQ. We think the product is fantastic, and we have several installations that have exceeded expectation." "By far VideoIQ has been the best product, performs the best in most every condition experienced here in the State of Florida. They also have fantastic support and reasonable pricing." "We have only worked with Video IQ. We like it and feel it is very simple and easy to use." "VideoIQ. Simple to setup and reliable." 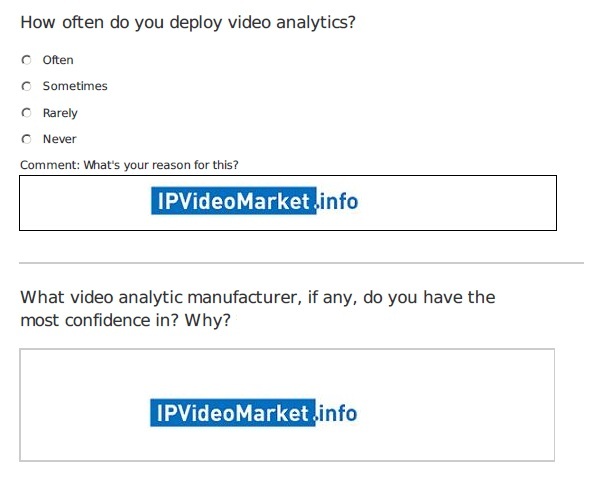 What's most noticeable about VideoIQ integrators' comments is how positive they are. 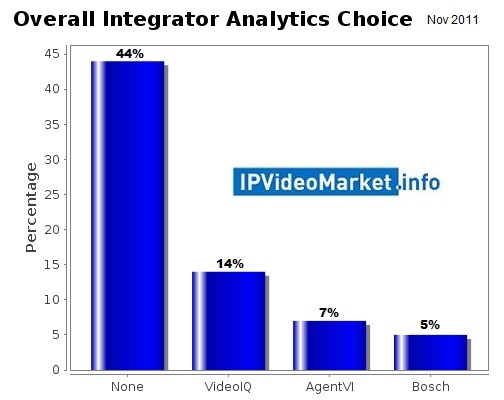 Integrators who like VideoIQ seem to really like it. Contrast this with the two competitors below, which sound less noticeably positive. "AgentVI, I really like their solutions. We use them for a server based solution"
"AgentVI. They market to Milestone partners quite a bit so we are familiar with their offering." "AgentVI is an interesting product as it loads on the Axis cameras and only records metadata. We use it when customers want analytics but do not want the expsense of FLIR/SightLogix type cameras"
The first thing readers may notice about these comments is that they seem much less enthusiastic or full of praise than comments regarding VideoIQ. It is not surprising, however, that AgentVI is in this second place position, however. Multiple manufacturers sell or have resold AgentVI analytics. Their compatibility with Axis is likely to make them more attractive to Axis partners, who can then use familiar Axis products, instead of learning a new camera line such as VideoIQ. "Bosch. It works well from what I have seen on numerous occasions. However they have limits like the other manufactures. Also, it's an easy add on to the camera if the client wants to pay a slightly higher price." 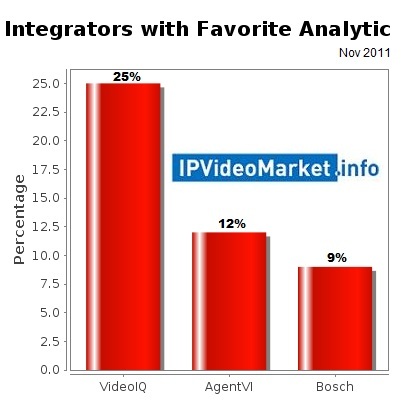 "Bosch, Simple and good integration with the best VMS on the market"
"BOSCH - Although we know that it is neither the most powerful solution or the most efficient, we have worked with BOSCH IVA from day 1 of its release"
Again, these comments are less overwhelmingly positive than VideoIQ, and tempered with mention of Bosch's limitations. "SightLogix. It's the only one that I've seen that delivers consistent results." "Sightlogix offers a very good camera with integrated anaytics at the edge and offers excellent perfromance in low light and over water applications." "Sightlogix - Their purpose-built hardware is highly effective at filtering out the environmental activity that triggers nuisance alarms in other analytic applications." One noticeable absence from these results in ObjectVideo. Given they had partnerships with practically every major VMS player, and the number of OEM partners they have (Cisco, Digiop, Pelco, and many more), the fact that they received no votes is telling. Indeed, there was only one mention of ObjectVideo, and it was a vote of no confidence. "We've only deployed in the real world ObjectVideo. I wouldn't say that I have any confidence in their product or organization. Shortly after deployment everyone we were involved with left the organization. Shortly after that they stopped supporting the product we just deployed." One other clear trend from the results is that the top choices overwhelmingly ran on cameras which goes back to the long standing 'Edge vs Core' video analytics debate. As we analyzed in our recent Ranking Video Analytics Architecture note, pushing analytics to the edge generally increases analytic performance. Given this, the integrator's favorites are in line with what is most likely to deliver robust field solutions. One interesting trend which emerged at the other end of the spectrum was the use of remote monitoring services. A handful of integrators answered that they were offering video monitoring services, and analytics were key in those deployments. While this is a small number of respondents, it is a non-trivial number. If we had asked this question a year or two ago, we suspect there would have been next to none offering these services. "We are a video guarding company. We almost always install some sort of analytic if we're going to take the signal and protect the customer's property." "Starting to deploy analytics more often these days. Launched Remote Monitoring Services and it comes in handy." "Most analytics we've used have been at car dealerships where we also offer alarm monitoring services."